Hurricane Irma – the most powerful storm to strike the United States since Hurricane Katrina – caused catastrophic damage as it cut across the Carribean and into Florida. Sarasota was spared from much of the devastation, but other parts of the state were not so lucky. In total, 134 people have died as a result of the superstorm. Ninety Floridians make up the largest part of that number. Gary Fronckoski, a Baltimore native and artist who now lives in Sarasota, has experienced communal heartache with his fellow Floridians. But memories of a personal nadir – a painful divorce which directly led Gary to a life-changing conversion to Christianity – have moved him to share one of his paintings, as a way to help anyone affected by Hurricane Irma. 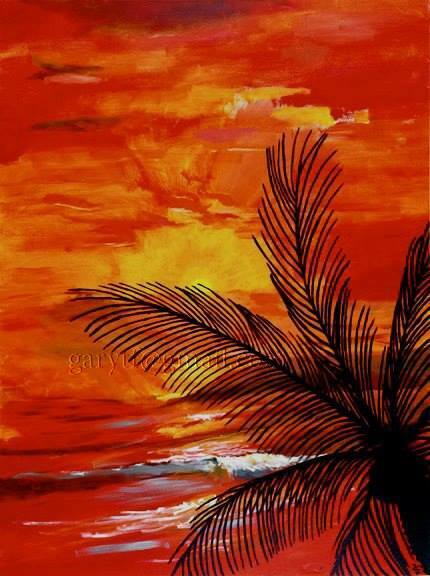 The painting, entitled, “After the Storm” depicts a cluster of palm leaves set against the backdrop of a deep red-orange sky. The gently-moving waters below the palm leaves reflect the warming waves of the rising sunlight. 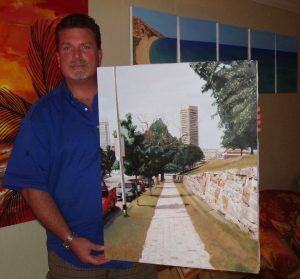 Artist Gary Fronckoski with his award-winning painting of a sidewalk along Federal Hill in Baltimore, Maryland. Fronckoski told WSRQ-FM listeners he is making 300 high-quality copies of his painting available for sale – with all of the proceeds going to help Irma outreach. “Oriole Magic Sarasota Style” by Gary Fronckoski. Fronckoski said the prints, which will be offered in three different sizes, will be produced using the fine art Giclée method. An award-winning artist, Fronckoski’s work often depicts ocean views, as well as scenes of Sarasota, Philadelphia, and Baltimore. One of his previous paintings has drawn acclaim from baseball fans across the country. 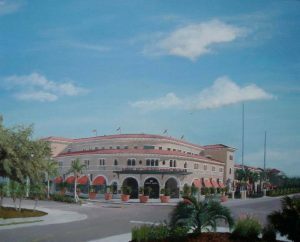 The pastel-hued work, entitled “Oriole Magic Sarasota Style,” is a meticulous rendition of Ed Smith Stadium in Sarasota, Florida. Sans urban eyesores, the painting wonderfully depicts the pleasing facade of the spring training home of the Baltimore Orioles. Fronckoski also does work on commission. His current project will portray circus star Nik Wallenda. “Nik is our own home-grown star. He’s done things like walk across the Grand Canyon and Niagra Falls on a piece of rope. Nik’s a strong man, inside and out. He’s another guy who wants to help out. That’s the reason I wanted to do this painting. Those interested in helping our neighbors by purchasing a copy of “After the Storm” may find it by visiting Gary’s site, Fronck Studio. “After the Storm” by Gary Fronckoski. ← Does Las Vegas Police radio traffic conflict with MGM statement?